My love of the outdoors started as a child with family trips to Lake Tahoe and Yosemite in California. Even at a young age, I had a penchant for exploring off trail and scrambling on rocks. In my early 20s I rediscovered the outdoors; mountaineering, scrambling and fastpacking around the Eastern Sierras in California. In 2005, while on a 20-mile day hike, I was introduced to the concept of ultrarunning, and the rest is history. No longer would I simply walk. Moving fast in the mountains became a way of life. Over the years I’ve run plenty of ultramarathon races, but my first love is still peak bagging, mountain climbing and scrambling. My focus has shifted away from races towards long mountain adventures, sometimes on trail, but most often off trail…seeking adventure wherever it presents itself. Favorite trail running memory: Watching the sunrise from Mt Harvard on day 2 of Nolans 14. 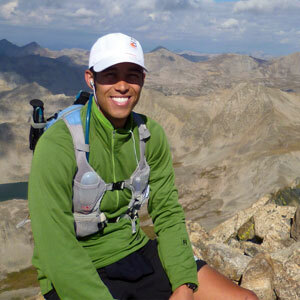 Adventure Runs; Aspen Four Pass, Grand Canyon R2R2R, Zion Traverse, Buckskin & Paria Canyon.